In order to get her mother's permission to attend a music conservatory, Ingrid finds herself with eight other teens on a three-week survival trek in Northern Ontario. The harshness of the conditions and the bleak backgrounds of her peers take her by surprise. She can't possibly imagine why her mother has sent her here. But as she starts to share the particulars of her own life in flashback, we gradually come to understand why she needs to be here. A tight ensemble piece, each of the characters have a clear and distinct personality. Ingrid, of course, shines the most strongly and is a sympathetic and appealing heroine. She is fiery and opinionated, but fragile at the same time and wears her heart plainly out on her sleeve. Her relationship with her mother, a fading opera diva, is complex and highly nuanced. 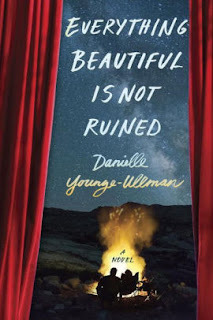 Her dramatic arc, while seemingly predictable, takes an unexpected and devastating turn at the end that provides a surprising payoff for the reader. This is a mature book, full of older teens who are worldly and wise. They speak frankly and honestly, and there is little wasted here on trite intrigue. A huge part of the appeal of this book is that honesty, featuring conversations that matter and resonate with the reader. It's not that the story is particularly new (there have been many stories about teens facing nature and the elements), but that it treats those young people with tremendous respect (without making them behave like adults). Highly recommended.